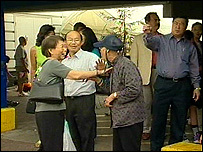 The Chinese Embassy has entered the row over the redevelopment of what it calls London's "second Chinatown". The owner of Oriental City in north London, Development Securities, wants to knock it down and rebuild it to accommodate flats and a superstore. But the Chinese consul general has written to London's mayor to express his "deep concern" about the project. Development Securities said it wants to recreate Oriental City "in a spectacular new home". Consul General Jiang Yuansong said plans to relocate tenants during building work were "inadequate" and he called for the proposal to be modified. He said the "hard work" of Chinese and other traders had made Oriental City in Colindale London's "second Chinatown" after the better known Gerrard Street in Piccadilly. The Colindale centre attracts 10,000 people a week to its shops, restaurants and events. Development Securities wants to rebuild it with 520 flats, a school and a superstore. Although existing tenants will be allowed to return to the new centre, they face up to three years of displacement while it is built. The project received planning approval from Brent Council in November. Building work is due to start within 12 months. In a letter seen by BBC News, Mr Jiang said the traders had made a "great contribution to the social, cultural and economic development of London". "It was reported that the rebuilding would have impact on about 1,000 Chinese families in the next 3-4 years if the present plan is approved," he said. "I would like to express my deep concern [about] the plan which [will have] a negative impact on so many Chinese families. "I also have great sympathy for the tenants, whose business would be affected if the proposed development goes ahead without modification." The planning application has been referred to Mayor of London Ken Livingstone who has the final say. Mr Livingstone said he will consider all interested parties views before making his decision. Yip Fai Liu, chairman of the Save Oriental City Campaign, said if the development went ahead it would break up the community. "It took us 10 years to build the Oriental City community, when we come back in three years' time, there will be no community left," he told BBC News. Laurence Martin, of Development Securities, said it was unlikely all the traders would be able to be relocated temporarily in one place. "We are committed to our tenants and to recreating oriental city in a spectacular new home," he said. "Accordingly, we have offered new leases to tenants within the development on completion."